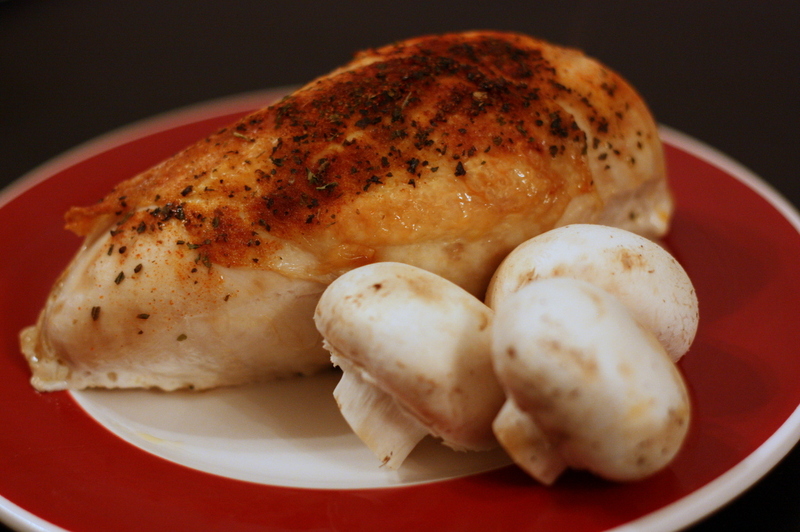 Did you know that baking chicken breast on the bone with the skin on, makes a marvelous difference in tenderness? The meat is so tasty and moist! If you bake several chicken breasts at a time, you will have leftover chicken to use in other recipes. So you can look forward to more recipes using after this one. Today’s song isn’t related to today’s food because after doing hours of reading for law school, my brain is not making any connections between food and jazz! So I think it is best to listen to one of my favorite jazz songs “Night and Day” sung by Ella Fitzgerald ! Rinse with cold water then blot chicken breast halves with paper towels. Place skin side up on baking sheet with at least 1-inch sides. Drizzle and rub olive oil over chicken breast halves. Combine basil, salt, black pepper, garlic, paprika, cayenne pepper, and parsley. Sprinkle over chicken breast halves. With two or three sheets of aluminum foil, fold sides together to make a large sheet big enough to make a foil tent over the chicken breast halves without touching them when crimped over the baking pan. Bake for 40 minutes. Remove foil. Bake for 5-10 minutes longer until skin is crispy.